I first found out about Podium.Me at a Radiocentre networking event up in Leeds, and discovered the fantastic range of opportunities Podium has to offer. I spoke to both the founder Camilla Byk and former Podium participant George about the company and the work they have achieved. Through meeting Camilla, I was lucky enough to be given the opportunity to create a series for BBC Radio Cambridgeshire. The slot on a Wednesday evening offers the local community of the county to talk about their passion. From a young age I have regularly participated in the exercise phenomenon – Parkrun. The weekly 5km run takes place every Saturday all over the UK and allows anyone to participate for free. 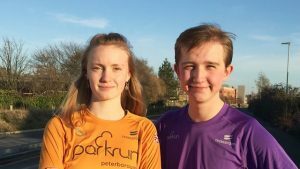 Since 2009, Parkrun in Cambridgeshire has taken off with over 2000 runners a week spread across nine different parks. The community aspect of the event is huge and I realised this series was a great opportunity to show off people’s passion for Parkrun. This series has been a great experience, from recording interviews, writing links and editing audio using BBC software. I believe it has certainly assisted my broadcasting career and knowledge. Airs on BBC Radio Cambridgeshire every Wednesday starting on 3rd April for six weeks.